Radiology CME / CPD Points for Running? Depending on which Radiology CPD / CME program you are enrolled in, there are a huge number of ways to get points. I would probably only use 2-3 categories of the 100 or more that the RANZCR has. But recently Ive thought that probably one of the most important things I can do to maintain my learning and be focused at work, is not present in any CPD programme. That is exercising. There have been may articles about the benefits of exercise for the brain, a very good article was in the New York Times Can Running Make you Smarter? (link at bottom of page). “To strengthen your mind, you may first want to exert your leg muscles, according to a sophisticated new experiment involving people, mice and monkeys. The study’s results suggest that long-term endurance exercise such as running can alter muscles in ways that then jump-start changes in the brain, helping to fortify learning and memory. ” NYT: Can Running Make you Smarter? I have always been pretty consistent with being active and exercising, mostly because I enjoy it rather than because I felt I had to do it. 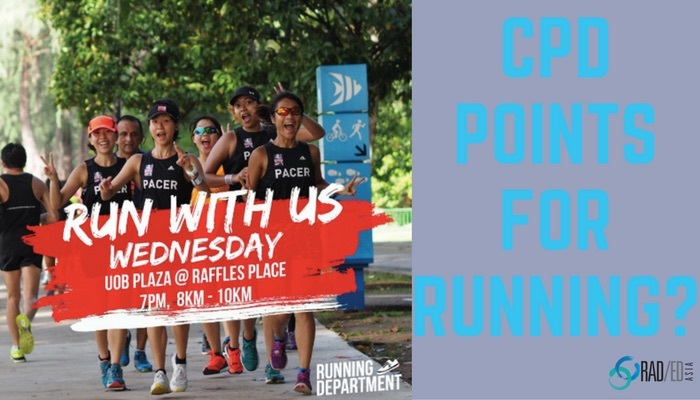 But I recently started running with a running group in Singapore, The Running Department, and the things I have gained by doing so had very direct parallels to learning and CME. Running: Previously my running, whilst consistent, was haphazard. Now there is a regular run twice a week with set distances and pace and with the aim of progressively improving, which has become a habit and something to look forward to. CME: Have regular days and times to read or do CME so that there is a routine and schedule which makes it easier to do. Running: We have a tendency to overestimate what we do and the benefits of it. When you are running, 1km can seem like 3km, and you finish feeling like you have done a lot, but not really. CME: Reading the odd journal here and there and turning up for a talk can make it seem like you have done a lot for the year but writing it down and tracking what you do gives you a much more accurate idea of how much you are actually doing. Running: It is so easy to give up whilst running ( I do it all the time). Your mind is constantly telling you to stop even when you are capable of doing a lot more. One of the great benefits of running in a group is that its much easier to ignore the tricks your mind plays on you. CME: Having another person or a group to do CME with make sit easier to do and persist with. Running: So often you see people exercising whilst talking to someone on the phone or messaging. There is no focus on the exercise which limits the benefit of it, but they still think they have done it because they have gone through the motions of it. Running: Last Saturday’s run, was partly along the beach and partly along construction for the new train line. All of it was exercise but the beach part I enjoyed the most and would not want to run again along the construction. CME: The environment we do CME in is important. A quiet place that you enjoy being in rather than a noisy place with distractions. Your Brain will thank you: For me there is no question that I feel better and am able to do and absorb more once I have exercised. There are many studies now that indicate that exercise has a very positive effect on your brain and its capacity. So here’s hoping that exercise will be included in my next year’s CPD points rather than a large list of near useless activities. “These experiments strongly suggest that while mental stimulation is important for brain health, physical stimulation is even more potent.” NYT: Can Running Make you Smarter? If you have got this far, the sole male in the header image and the only one who looks likely to collapse, is me.